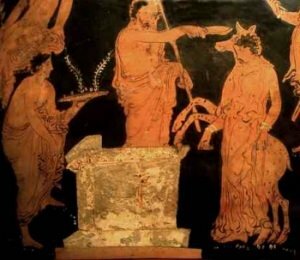 In this scene, the slave of Agamemnon is carrying a letter which could jeopardize the progress of the Greek armed trip against Troy (it is to stop the sacrifice of Agamemnon’s daughter to satisfy Artemis). Menelaus, the husband of Helen, and thus the one who most personally desires the war against Troy, stops the slave and tries to take the letter away from him. It is interesting how strong the slave stands against a king in this short scene. The original Greek is set forth below the translation. As the original is verse, I worked the translation out as blank verse. I have tried to maintain some of the wordplay of Euripides. Such things as you should never dare. Back off: you’re far too loyal to your lord. Into this message which here I bear. Nor you to bear this evil for the Greeks. But you, release this scroll to me. Well then, my scepter soon will bleed your crown. What fame to die in service of my lord. Such big words for such a slave to spout –move! O Master, we shall be defamed — the letter! From out my very hand, Agamemnon. Μενέλαε, τολμᾷς δείνʼ, ἅ σʼ ουʼ τολμᾶν χρεών. ἄπελθε· λίαν δεσπόταισι πιστὸς εἶ. καλόν γέ μοι τοὔνειδος ἐξωνείδισας. κλαίοις ἄν, ειʼ πράσσοις ἃ μὴ πράσσειν σε δεῖ. ουʼ χρῆν σε λῦσαι δέλτον, ἣν ἐγὼ ʼφερον. οὐδέ γε φέρειν σὲ πᾶσιν Ἕλλησιν κακά. ἄλλοις ἁμιλλῶ ταῦτʼ· ἄφες δὲ τήνδʼ ἐμοί. σκήπτρῳ τάχʼ ἆρα σὸν καθαιμάξω κάρα. ἀλλʼ εὐκλεές τοι δεσποτῶν θνῄσκειν ὕπερ. μέθες· μακροὺς δὲ δοῦλος ὢν λέγεις λόγους. Ἀγάμεμνον, οὐδὲν τῇ δίκῃ χρῆσθαι θέλει. Euripides, Euripidis Fabulae, Ed. Gilbert Murray, Vol. 3, ed. Gilbert Murray (Medford, MA: Clarendon Press, Oxford, 1913).